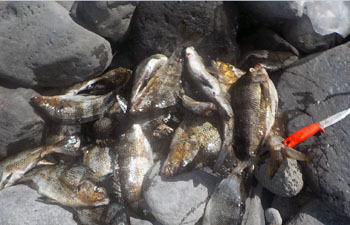 News of commercial and domestic fishing in the waters of the Tristan da Cunha archipelago. 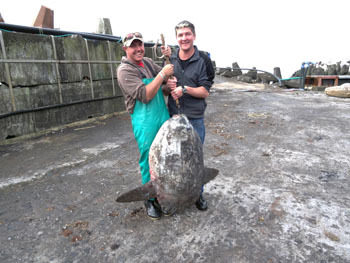 Joe, Keith, Grant and Jason Green caught a large sunfish when out fishing on 2nd June. 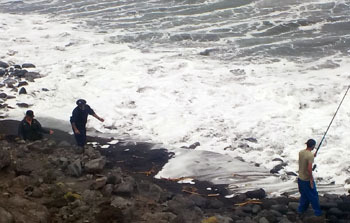 The photos show Jason (left) and Justin (right) with the fish. Justin is over 6ft tall so the fish must be approx. 1 metre long. The sunfish is likely to be an ocean sunfish or common mola Mola mola, which is the largest known bony fish in the world and lives on a diet mainly of jelly fish. 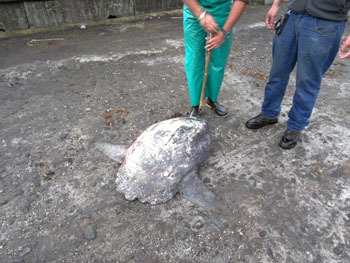 This may be the first recorded finding of an ocean sunfish in Tristan waters. A much smaller Slender Sunfish, Ranzania laevis also rare fish in Tristan waters, was discovered on a Tristan beach by Mark Swain in March 2015 - see Wild News 2015 for details. Weather has continued to count against us with only 25 fishing days possible so far since the start of the season on 1st July 2015. year. The very good news is that we have landed nearly 500 kg per day more on average than by the same time last year. This makes the scarcity of fishing days all the more frustrating because the results are so positive. Production is being maintained at a level of 50% tails and 50% being processed further into Raw, Cooked and Sashimi. The present harbour repairs have unfortunately meant that on two occasions we were unable to pump seawater to the factory so had to tail all lobster landed on those days at the cost of more valuable production. We seem to have this in hand now so hopefully on the next fishing days we will be able to keep lobster back for purging and production. 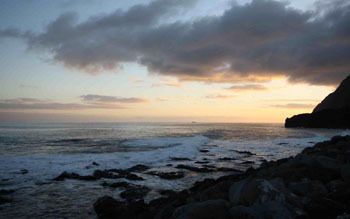 Sunrise over Big Point with MV Edinburgh engaged in fishing in the distance. 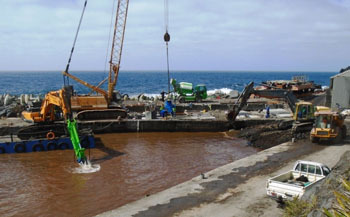 The harbour work is coming along very well and wave action has already been reduced in the harbour as expected. An impressive amount of work is being performed by the 11 strong team from Sea and Shore who are working flat out 7 days a week to try and complete what is a very big task. Octopus landings this year are surprisingly high and currently about 46% higher than last year. There is no obvious reason for this, but with octopus competing with lobster for bait in the traps we hope this is not the start of a trend. We currently have about 37 tonnes still to land so the Edinburgh might be required to land an additional portion of the quota during her next trip out from Cape Town departing at the end of March. Hopefully I can report the quota fully landed when the season closes at the end of April. Dredging in Calshot Harbour - see the 2016 Harbour News page for more about the harbour works. 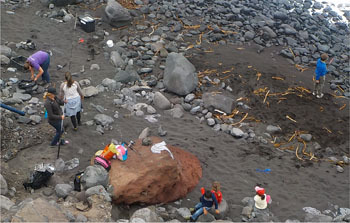 Islanders gathered on Runaway Beach on 26th December left, and a few of the fish caught right. 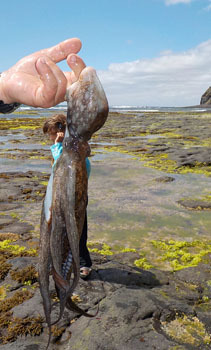 Scenes on Runaway Beach show the shallow rock pools and, left a small octopus (known on Tristan as a catfish) caught and ready for the pan (but legs are also prized as fishing bait too). 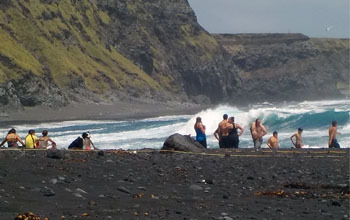 Left and below: Islanders fishing with rod and just lines on 7th January. 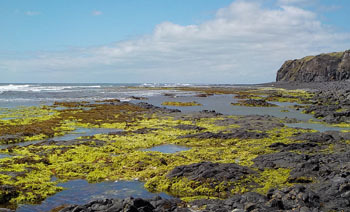 Tristan fishing has had a slow start, mainly due to weather conditions not allowing many opportunities for fishing days. We are nearly five months into the season which started on 1st July and have only managed 16 fishing days so far. Of the 42 tonnes landed to date we have packed around 58% into various whole forms - Raw, Cooked, Sashimi and the remaining balance of 42% into tails. Both October and November have seen extreme conditions and the amount of rain we have had during this time is the worst seen in living memory by many of the older islanders. We are also seeing New Zealand flax buds emerging over a month late and garden plants flowering later than usual. This in turn could be having an impact on fishing/lobster cycles as well. Everyone is hoping that we will experience an increase in landings either between now and break-up day or early in the New Year when we return to work after the holidays. The Edinburgh is likely to operate around Tristan for a few days in December prior to leaving for Cape Town as that provides an opportunity to land additional lobster for delivery to Cape Town before the end of the year. Harbour works are likely to further disrupt fishing operations early next year, but hopefully not to a large extent. with the previous two seasons' quotas for comparison. 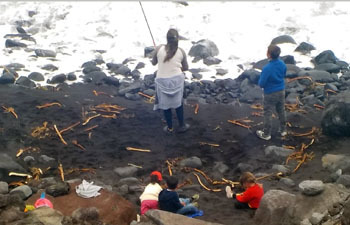 The Tristan da Cunha Fishery has the top international standard Marine Stewardship Council accreditation. A crucial part of this is a sustainable fishery with dynamic quotas based on fish samples to ensure future stock and a healthy future for the Tristan economy, so heavily dependent on income from fishing. So quotas will be expected to fluctuate. Re-certification is taking place during 2015 and a MSC workshop has concluded in Cape Town during November 2015. We look forward to publishing positive results from this exercise before long.